“Who is going (to be stupid enough) to touch the lions? Contemporary South African fold song. One of the enduring stories of the battle of Isandlwana is that of Captain Reginald Younghusband and his “C” Company. Positioned to the north of the British camp in the opening stages of the battle, when it became clear that the line could no longer hold against the hordes of Zulus swarming around it, a “strategic retirement” to a better position on the higher ground up the slopes of the mountain itself was obviously in order. Please note that the British Army NEVER retreats – only retires, withdraws, evacuates … but never retreats. Only the enemy do that. A number of cairns/ mass graves running from north to south along the eastern face of the mountain mark “C” Company’s possible withdrawal route as the men of the rapidly thinning group made their way upwards towards the southern shoulder of the mountain. Militarily, it was the correct thing to do. Command of the high ground was imperative. So long as ammunition resupplies kept pace with the Company on their journey up the side of the hill, things might have turned out a little differently. One does not know if they managed to get a re-supply earlier on, but if they had only had the standard issue 70 rounds per man, they must have been running perilously low by the time they reached the shoulder. However, the 1st Battalion’s reserve ammunition was unreachable, situated as it was to the eastern face of the Stony Kopje (or Mahlabankosi or Black’s Kopje, whichever one prefers) some 300 yards away to the south. They might have been able to “borrow” some ammunition from the 2nd Battalion’s reserves, situated a mere 100 yards to their east at the base of the hill, but with Zulus swarming all over the place, that too, was impossible. The Second edition of Colenso and Durnford’s “History of the Zulu War” states that the Zulus here, mainly the uVe ibutho, had some elements of the right horn join them in order to finish Younghusband’s men off. The end was inevitable. Staying on the shoulder would spell doom to the men. Below them, various knots of struggling men fought on in the saddle between the mountain and Black’s Kopje. Whether Younghusband decided to try and join them, or else resolved that taking a few more Zulus with them in a suicidal bayonet charge down the mountain was better than being slowly eliminated on the shoulder, is anyone’s guess. That the charge took place is confirmed by Colonel Black, who returned to the site on 21st. May 1879 with members of the newly formed Cavalry Brigade under General Frederick Marshall. “The Zulus could not get at them at all; they were shot and bayoneted as fast as they came up. At last the soldiers gave a shout and charged down upon us. There was an induna in front of them with a long, flashing sword, which he whirled around his neck as he ran – it must have been made of fire. They killed themselves by running down, for our people got above and quite surrounded them. A survivor of Younghusband’s company, had not joined the last rush onto the nek with his Captain, but had instead retreated to the foot of the cliffs below the high peak. Here, there is a small cave, no more than 2 or 3 metres high, extending back about the same distance into the hillside. The entrance is screened by several large fallen boulders, and the last few metres of the approach are steep. This the soldier defended, shooting or bayoneting every Zulu who came near, until at last they grew tired of him, and several Zulus with rifles fired a volley into the cave – and killed him. It is said that this anonymous survivor held his position until “the shadows were long on the ground”. Wedged into the recess at the end of the cave, exhausted, thirsty and highly agitated, aware of the terrible fate that ultimately awaited him, with fleeting glimpses of fanatical Zulus flitting across his front, this must have been a traumatic experience indeed. So much so, that Dublin painter Richard Thomas Moynan painted the scene and called it “The Last of the 24th”. It is a tremendously powerful picture, showing self sacrifice and stoic resignation to one’s fate at the end of a long, hard road, so dearly beloved by Victorian audiences. Of course, it meant nothing to the Zulus, but then it wasn’t meant to – it was aimed at a well heeled, sentimental Victorian market. 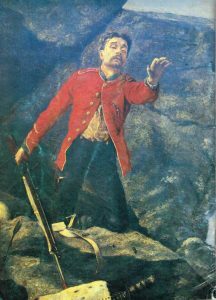 Mike Snook in his “How Can Men Die Better?” says that “it was appropriate that the last member of the 24th to die at Isandlwana did so in an act of supreme defiance”. There must have been many, many panicked survivors attempting to find refuge all over the mountain, which is riddled with caves and crannies. Why has this particular cave been singled out? Is it because it’s the closest to the site of the stand on the knoll? If this whole incident indeed happened, who was he? There is no evidence, only an assumption, that he was a member of Younghusband’s company. There is no evidence even that he was a 24th man. He could have been anyone. If he had lasted until “the shadows were long on the ground”, in other words mid-afternoon at least, how much ammunition was he carrying, bearing in mind that Younghusband’s bayonet charge was probably prompted by the lack of it? There are many caves on Isandlwana, but I have always gone along with the assumption that the one we’re talking about is the one above what might be called “Younghusband’s Cairn” on the southern point of the hill. One of my tourists the other day queried that, pointing out one particularly prominent cave on the other end, at the rump or northern end of the Sphinx-like mountain, overlooking what is now the entrance gate. His argument was that if “C” Company had been positioned there before their precipitous flight, maybe one of the men decided to hive off and take up a position in the northern cave while the remainder of his company made their way along the face of the mountain towards the south. Perhaps he hoped to be missed for a while as the Zulus were concentrating on the southern side of the mountain and away from his position? The argument makes sense. So, then, if (and it’s a big if) the legend of the man-in-the-cave is true, which cave was it? And who was he? And I disagree with Mike Snook here. There is no good way to die – it’s infinitely better not too. And I doubt if, at that stage, he was in a state of “extreme defiance”. If one looks at his face on the painting, as they say in Afrikaans, he was probably just “gat vol” and wanted to get it over with.